Hardwood brings added value and character to your home. With many different species and finishes to choose from we can help you find the right hardwood floor for your home or office. For natural warmth and charm and a look that goes with any design style, hardwood floors are an easy choice. Hardwood floors add a beautiful touch while also adding value to your home, and are highly appraised in the resale home market. Today’s hardwood floors have made advances in style, durability, maintenance and care, making them more widely usable throughout the home. There are many aspects to consider when choosing hardwood flooring. The type of construction, finish and installation method are all decisions in which you will be involved. There are hundreds of choices in style and color with today’s options, including exotic hardwoods and unique finishes. 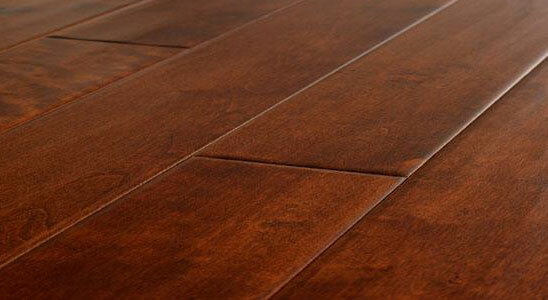 Most wood floors are available in several grades in a wide range of prices. There are many aspects to consider when choosing hardwood flooring. The type of construction, finish and installation method are all decisions in which you will be involved. Your floor’s appearance will depend greatly on the species of tree from which it’s made as well as the stain you choose. The species are wide and varied, including Cherry, Oak, Maple, Hickory, Pine, Ash, Cedar, Walnut, Brazilian Cherry, Doussie, Iroko, Beech, Birch, Red Oak, Jarrah, Merbau, and Rosewood. Oak is by far the most popular in the U.S.
Each species has its own identifying grain pattern, color, and texture. The pronounced grain and natural golden color of oak, for example, would never be confused with that of the reddish tone of cherry.